What colors make black ink? 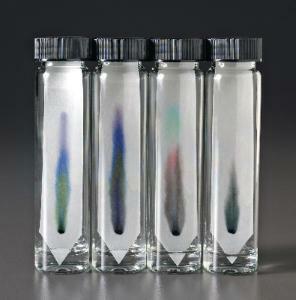 In this lab activity, students will master the techniques of paper chromatography. Using paper chromatography, students will separate the inks of several water soluble pens, calculate the relative rate of flow for each color dye on the chromatogram, and identify a type of pen based upon the quantitative measurements obtained. This activity allows students to explore NGSS Physical Science Disciplinary Core Idea PS1 (Matter and its Interactions). 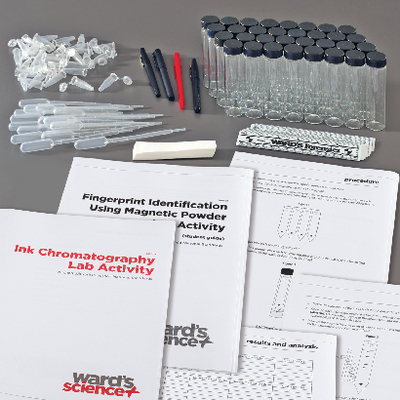 Ordering information: Lab materials include Chromatography vials with caps, Chromatography paper strips, 4 different pens with water soluable ink, Rulers, Microfuge tubes, and Pipets. Materials not included are Distilled water; 100 mL, Scissors, Pencils, Notebook paper, and Plain white paper.